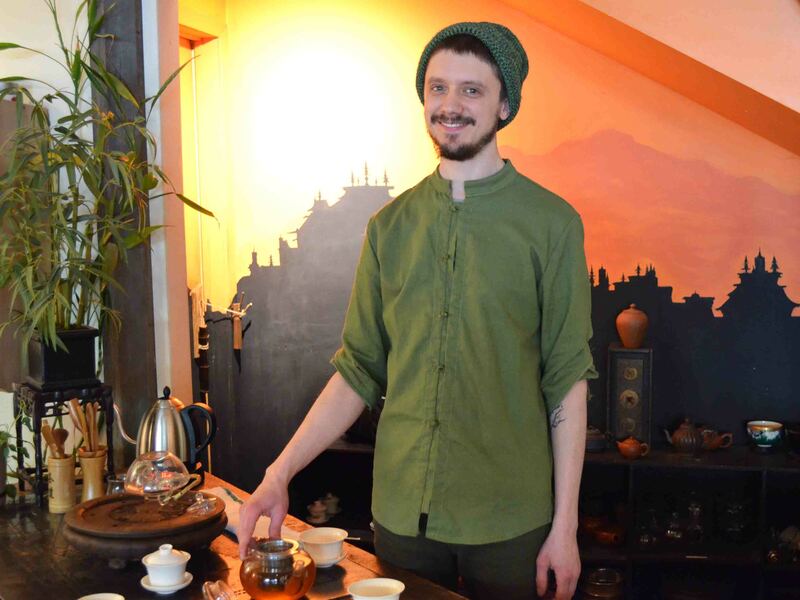 Around The Tao of Tea, staff are frequently blending herbal concoctions of all kinds for their daily enjoyment — some are strong and pungent brews, the pot packed full of myriad ingredients, while others are a careful mixture of 2 or 3 complementary herbs. 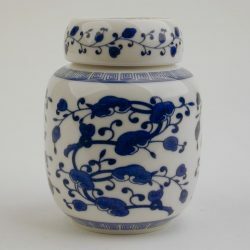 In any case, these creations always seem personal and individual, bearing the unique signature of the person making them. Alicia says this blend was inspired by a health book she was reading that discussed the benefits of raspberry leaf, which some say is anti-inflammatory and positive for women’s health. She added some local honey for sweetness and indeed this was a tasty and nourishing infusion. 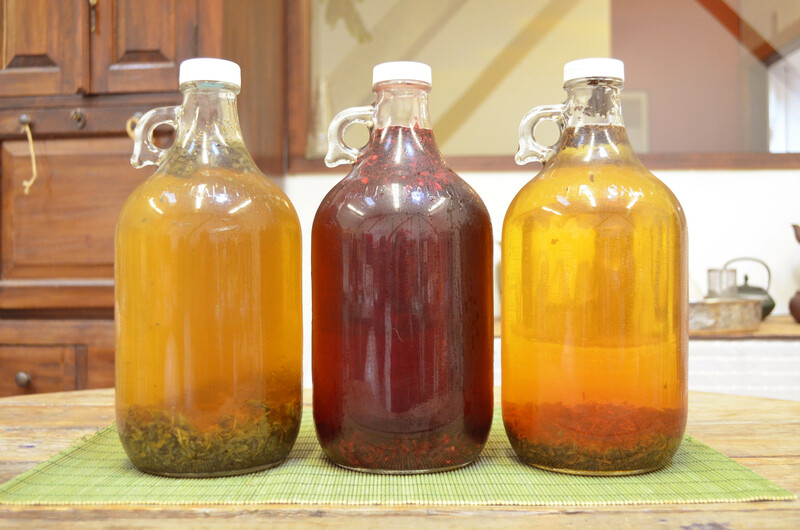 Sly’s Brew: Green Rooibos, Lemon Balm (base) and Echinacea, French Verveine, Licorice, Cinnamon (accents). 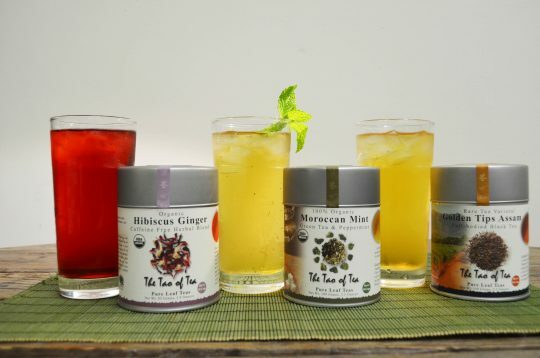 Sly uses Green Rooibos and Lemon Balm as the base for a lot of his herbal infusions. 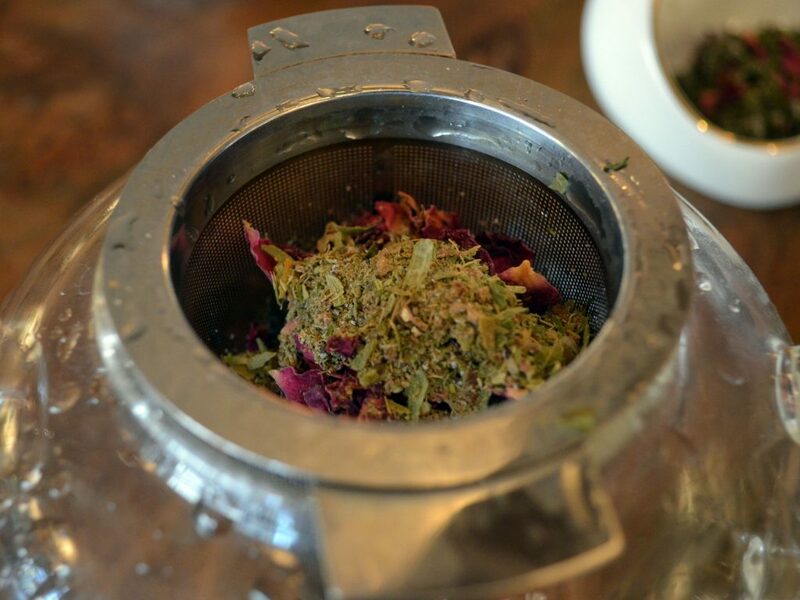 “The Lemon Balm coats the tongue and is kind of calming, whereas the Green Rooibos tastes grassy and alive.” From there, he chooses other herbs to accent this blend, depending on what flavors or benefits he is looking for that day. 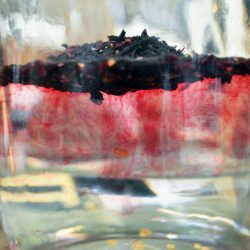 In this blend, the cinnamon bark chips and licorice add a nice natural sweetness to the infusion. 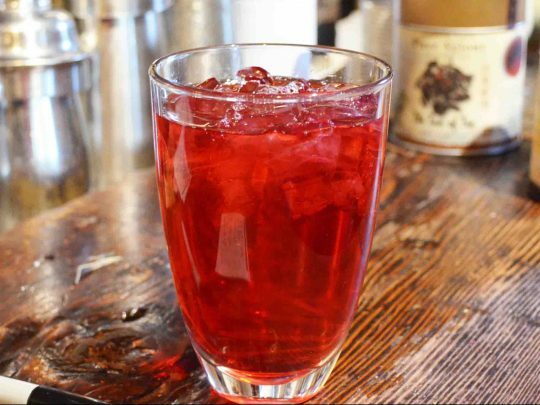 Matt’s Iced Brew: Hibiscus, Lemon Myrtle and Lavender. 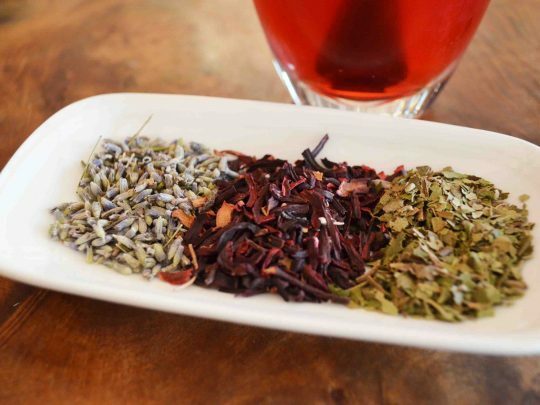 Also known as “Heaven’s Blend” (named by Sonam in our teahouse), Hibiscus, Lemon Myrtle and Lavender combine to make a tasty iced tea. Matt created this blend as the weather started heating up this spring; it was so well-liked that we started sharing it as a special. We find that the lavender offers a cooling and sweet contrast to the bright tartness of hibiscus. The lemon myrtle adds a gentle citrus quality that ties it all together. 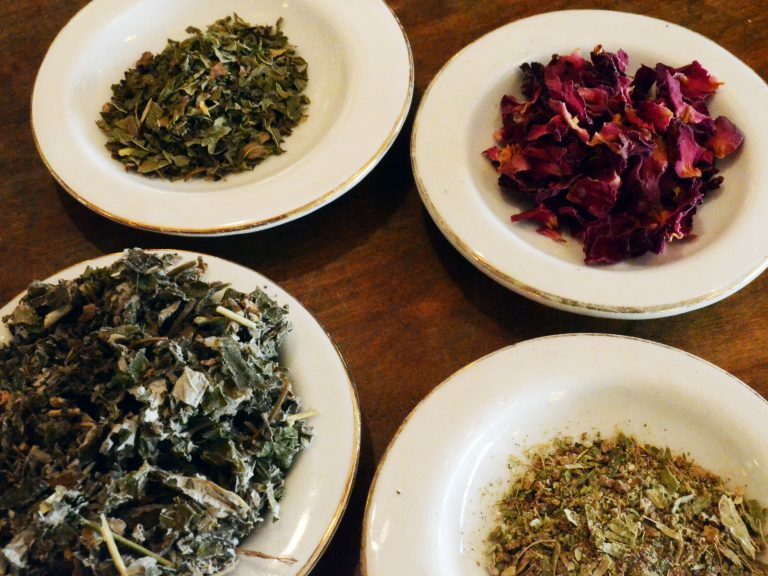 The Yoga of Herbs: An Ayurvedic Guide to Herbal Medicine by Dr. David Frawley and Dr. Vasant Lad features most of the herbs we carry at The Tao of Tea and gives great insight into their uses. Jennifer’s Brew: Ginkgo, French Verveine, and Licorice. Wade’s “Ultimate Blend”: Lemon Balm, French Verveine, Vana Tulsi, Red Raspberry Leaf, Lemon Myrtle and a little Spearmint. 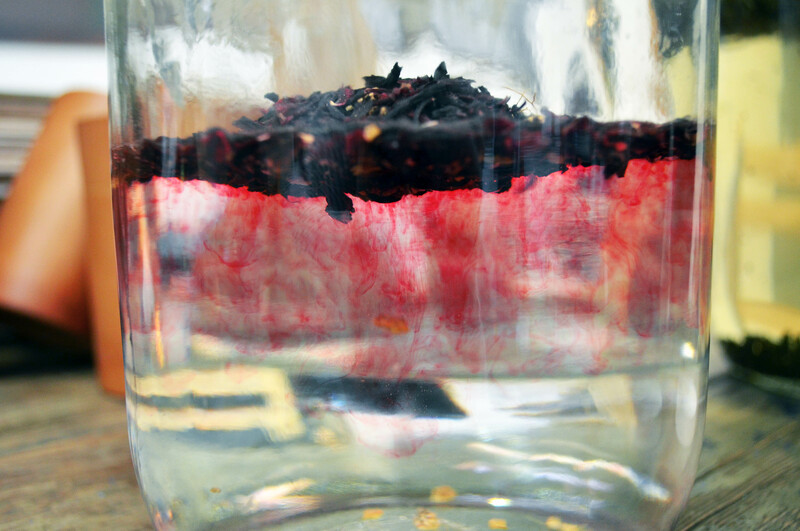 Melissa’s “Tea Room Favorite”: Purple Leaf Tulsi and fresh grated ginger. Yerba Mate was first used by the Guarani Indians, who believed it could cleanse and heal the spirit. Now millions enjoy it in South America. In Brazil, the drinking of Yerba Mate is practiced as a social ritual. Friends and family gather in a circle as the host prepares the beverage in a gourd and drinks the first infusion with a filtered straw called a bombilla (Spanish) or bomba (Portuguese). The gourd is refilled and passed to each guest in the circle. Everyone shares the same gourd and bomba, joining in a bond of acceptance and friendship. 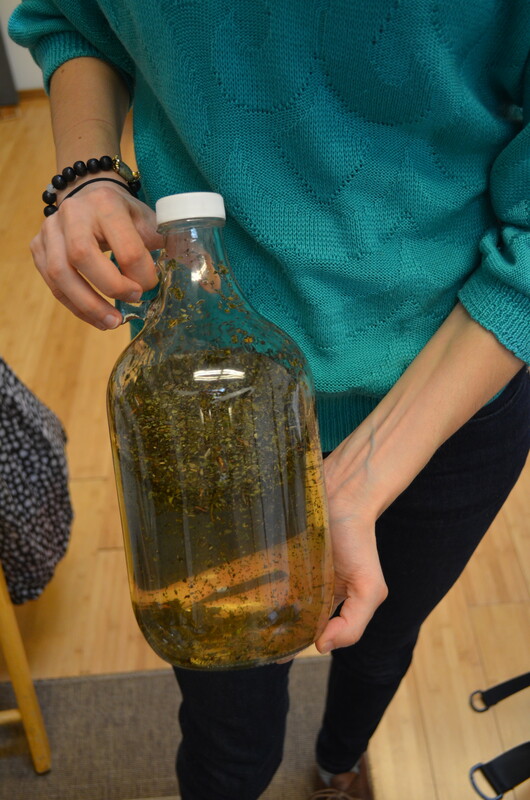 In the following video, Cinthia demonstrates how to brew Yerba Mate while talking more about the tradition behind it. Cinthia comes from Southern Brazil, not far from the border region with Argentina, Paraguay, and Uruguay, where Mate is enjoyed on a regular basis. Bomba or bombilla: This filtered straw is used to drink the Mate. They are often made of bamboo or stainless steel. Gourd: Mate cups are often made from natural gourds or wood. 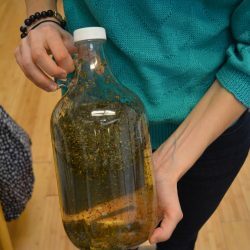 Fill your gourd 3/4 full with Mate leaves. Fill the gourd with hot but not boiling water (around 165 – 175°F) until it is full. Let the Mate sit overnight. Top off the gourd with more water as the water absorbs. Rinse out the gourd thoroughly. For natural gourds (ones not made of wood): Your gourd may have seeds and a natural membrane. Some of this may wash out when you cure it; this is normal but there is no need to excessively scrub the inside. Let your gourd air dry. Always rinse your gourd after use with warm water. Do not use soap because it will absorb into the gourd and flavor your mate. Never use boiling water, as it may crack your gourd. Let the gourd air dry, preferably at a 45° angle, to prevent mold growth. Argentinian Yerba Mate (Argentina): Crisp, herbaceous, vegetal aroma and taste. Chimarrão (Iguaçu Valley, Brazil): Powdered Yerba Mate that is strong, herbaceous, grassy, and slightly smoky. Rio (Iguaçu Valley, Brazil): Cooling, clear, bittersweet flavor notes. Roasted Mate (Southern Brazil): Toasty, smooth, and full-bodied with light cocoa notes. Look out for more Yerba Mate videos in the future! 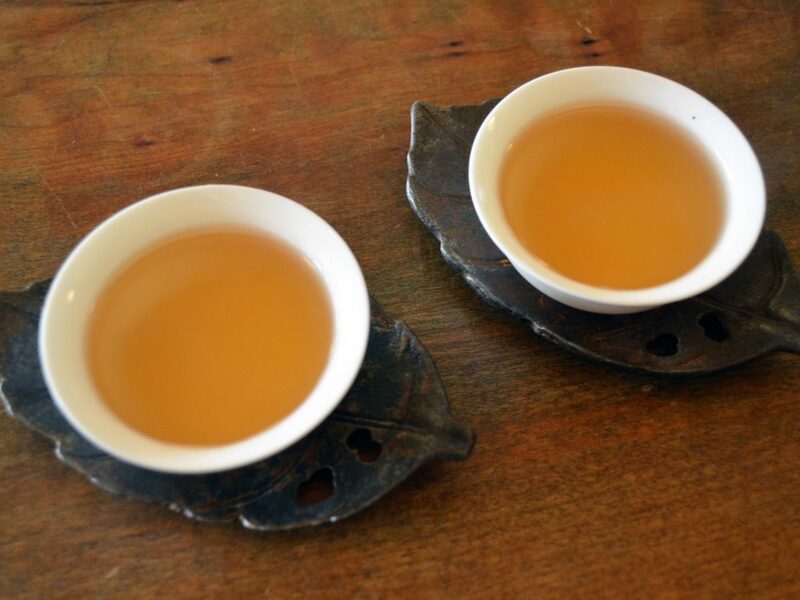 Gongfu brewing is a ritualized form of preparing tea that works well with oolongs and puers. 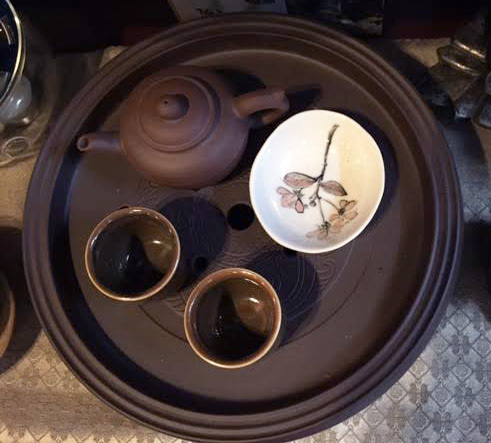 The Gongfu tea ceremony originated in the Song Dynasty and by the Ming Dynasty had become more widespread, used especially in Fujian and Guandong. “Gongfu” refers to something done with skill. Indeed brewing in this way can bring out the best flavor in a tea, as one controls variables like water temperature and steep time. 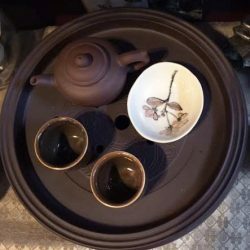 In addition to producing a great brew, it is a beautiful ritual and certainly can heighten the experience of brewing tea and sharing it with others. A Tea Boat – The tray on which the tea is brewed. The boat has slats or holes in the top that allow water to fall through into the lower tray or vessel below. Tea Leaf Holder – Holds the dry tea leaves and displays them before brewing. Usually designed for easy pouring of the leaf into the pot. 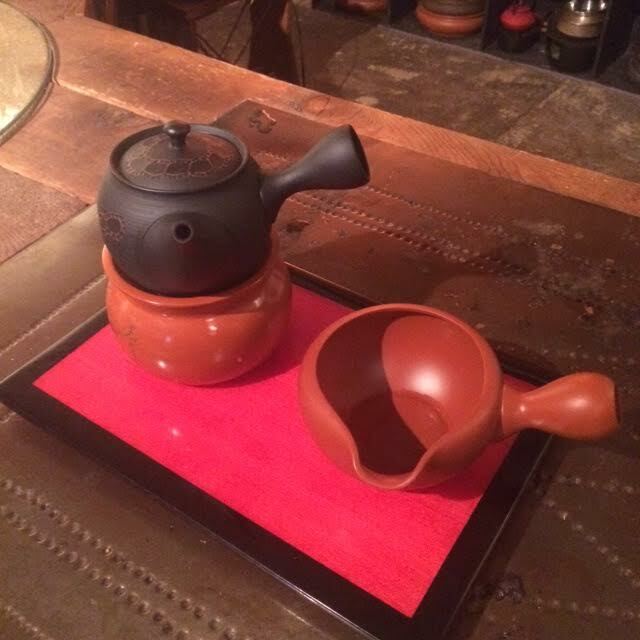 A Gongfu Pot – Often made of clay, which retains heat well as the tea brews. Pitcher or “Fair Cup” – The pitcher will hold the brewed tea once it is done steeping in the pot. The name “fair cup” refers to the fact that everyone will get exactly the same brew if the tea is decanted first. Cups – A small set of cups is given to each tea drinker. One is a tall aroma cup, and the other is a shorter drinking cup. Tea is poured first into the aroma cup and, from there, into the drinking cup. Take a look at the video below for a demonstration. Other small implements may be used like a bamboo tea scoop, a brush for wiping down teapot and teaware, etc. 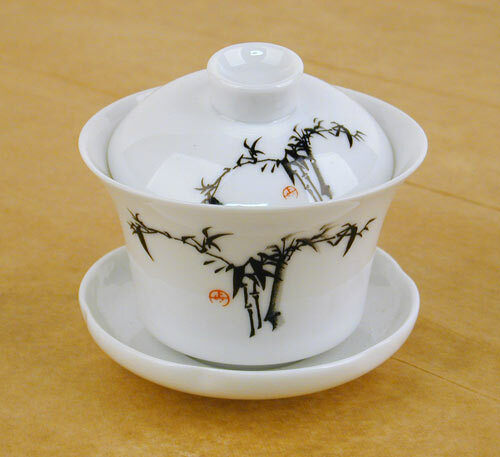 The Gaiwan is a traditional Chinese cup used for tea brewing. 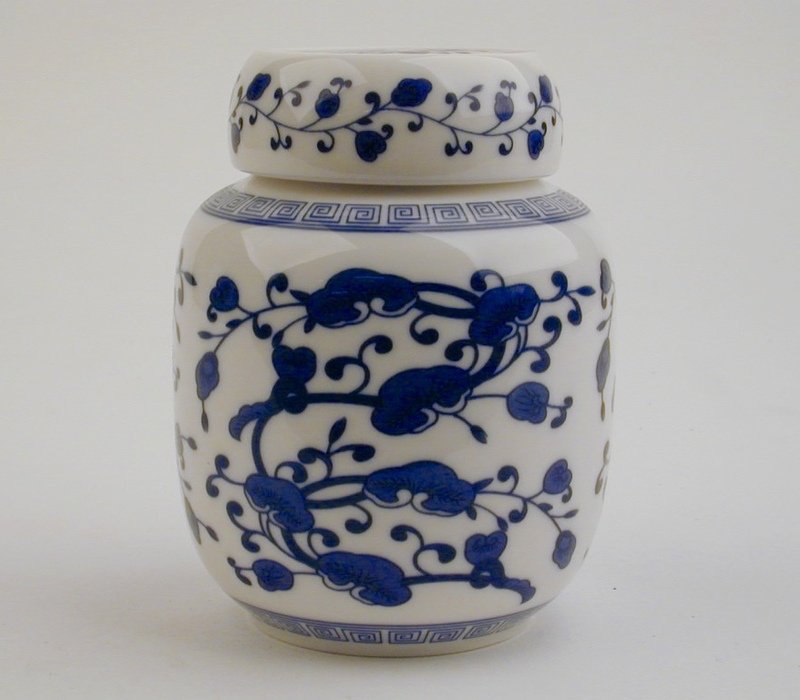 It has been used in China since the Ming Dynasty (1368–1644). Gaiwans consist of a lid, cup, and saucer. The tea is brewed inside the cup, and the lid is designed to strain out the tea leaves. Once the tea is steeped, one can drink from the Gaiwan, or they can pour the tea from the Gaiwan into another cup or pitcher. Check out the video below for an example of the Gaiwan brewing method. The Genmaicha Latte is a creamy, caffeinated drink ideal for latte lovers. It can be made with our special powdered Genmaicha sticks. 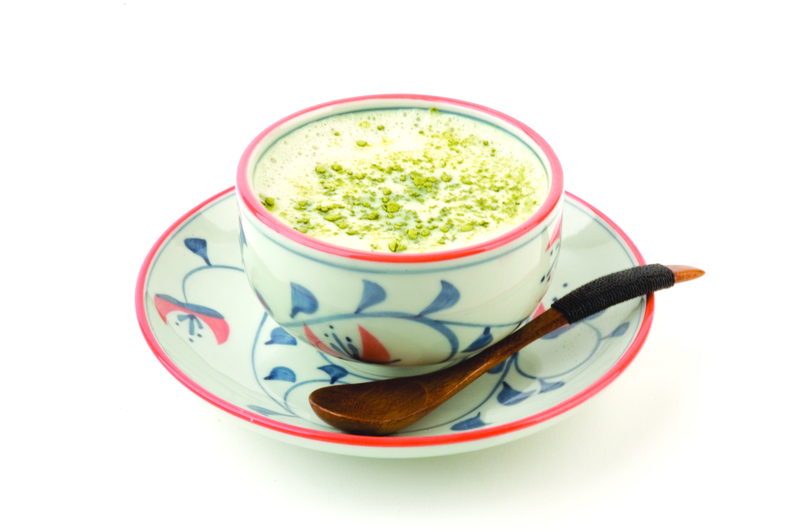 A Genmaicha latte can be prepared on stove-top or with the steamer of an espresso machine. Asian-style espresso cups are ideal for this presentation. Place three heaping scoops (or one Genmaicha stick packet) into a small amount (around a tablespoon) of hot water and whisk the powder into the water until it is dissolved. 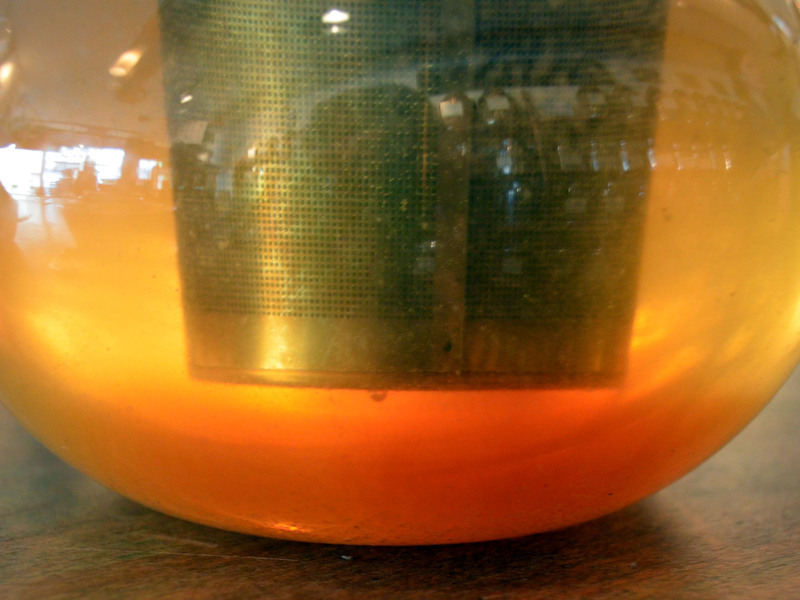 Add 8 oz milk (or non-dairy) to the dissolved Genmaicha powder. Bring to a boil once, or steam with espresso machine. Garnish with Genmaicha powder on top. 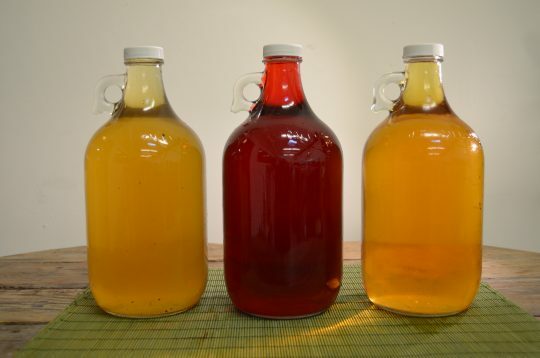 Sweetener options: vanilla, honey, cane sugar, stevia. Energizing and creamy with a dry taste of fresh greens and toasted rice. Ideal in summertime, for those craving an iced, natural, caffeinated and refreshing beverage. 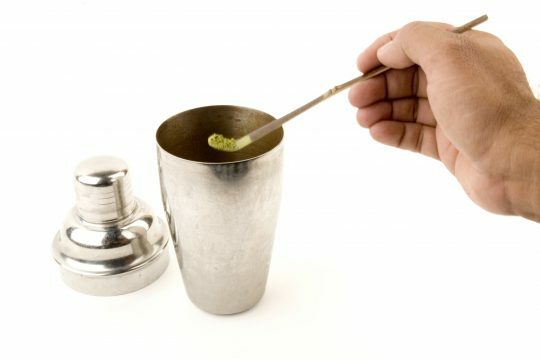 Place three scoops of Genmaicha powder (or 1 Genmaicha stick packet) into a cocktail shaker. Add a splash of hot water (approximately 2 oz) and swirl or whisk the Matcha and water together until the powder is dissolved. Fill the shaker half full with ice, then fill with room temperature water, shake well, and pour into a glass. Garnish with mint or ginger. Sweetener options: honey, cane sugar, stevia. Toasty, sweet brown rice aroma and a smooth roasted flavor with a bright, grassy edge. Ideal for those who love both the rich spice combination of Indian chai, and the creamy, sweet, textured experience of drinking Matcha. 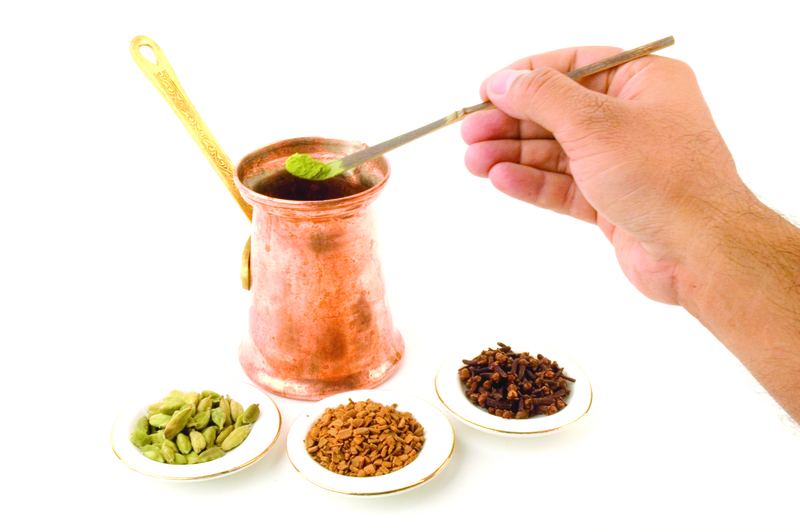 Small Ibrik (stove-top boiler), heat-resistant chai cups or tea glasses, matcha tea scoop. Place three heaping scoops of Matcha into a small amount (around a tablespoon) of hot water and whisk the powder into the water until it is dissolved. Add 8 oz milk (or non-dairy) to the dissolved matcha. Add chai spices of choice (cardamom, cloves, ginger, cinnamon). Bring to boil once, or steam with espresso machine. Add sweetener. Strain and serve. Garnish with any of the powdered spices. Uplifting, warming mélange of sweet and spicy flavors. Creamy — Ideal for latte lovers. 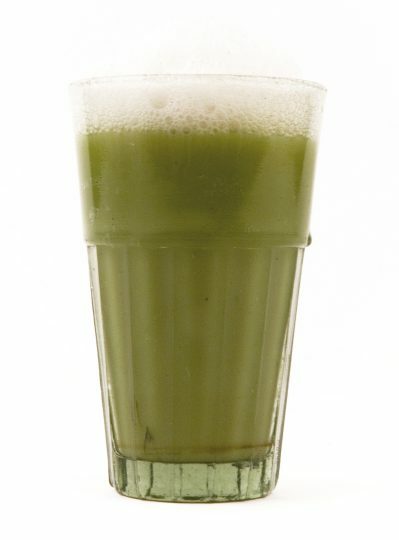 A Matcha latte can be prepared stove-top or with the steamer of an espresso machine. Asian-style espresso cups are ideal for this presentation. Add about 1.5 teaspoons (or 3 heaping scoops if using a chashaku) to a small amount of hot water (around a tablespoon) and whisk the powder into the water until it is dissolved. You can then prepare the beverage like an espresso latte (steam around 8 ounces of milk and pour over the matcha), or you can add your milk directly to the matcha and heat over the stove, bringing to a boil once and then removing from the heat. Garnish with Matcha powder on top. 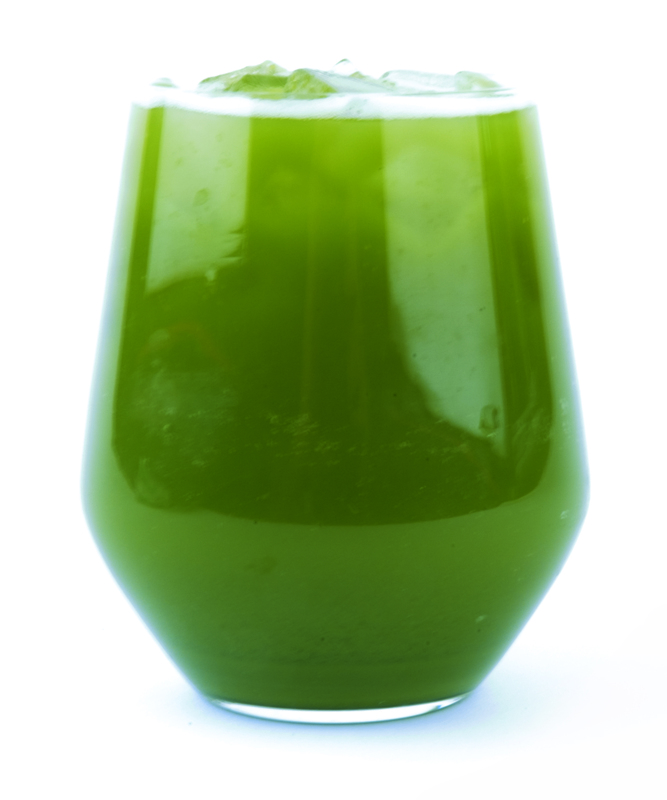 Energizing, creamy, dry taste of fresh greens. 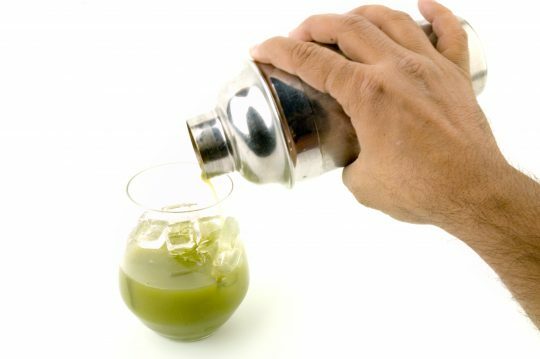 Place three scoops of Matcha into a cocktail shaker. Add a splash of hot water (approximately 2 oz) and swirl or whisk the Matcha and water together until the powder is dissolved. Fill the shaker half full with ice, then fill with room temperature water, shake well, and pour into a glass. Garnish with mint or ginger. This can also be done with our special Genmaicha Powder. Refreshing and cooling with full, rounded, dry texture. 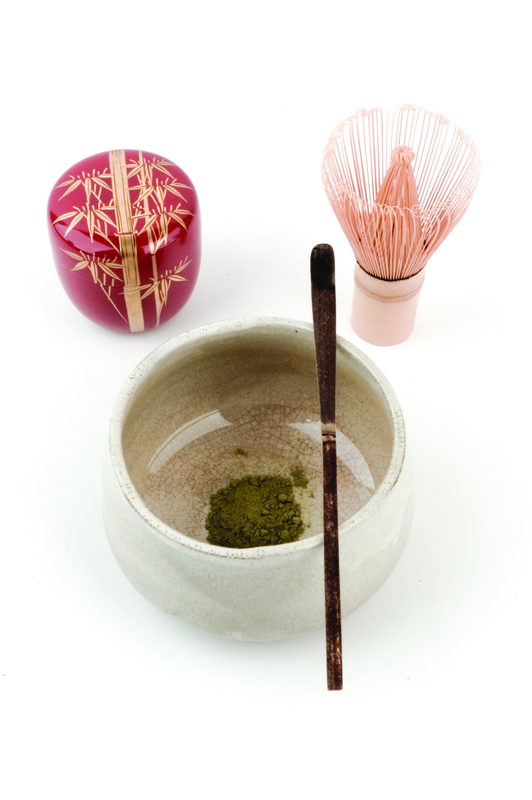 Although the traditional Matcha style has its origins in the elaborate Japanese tea ceremony, a simplified presentation creates a memorable experience for the tea drinker. The Matcha bowl, or Chawan, is used to prepare and drink Matcha. 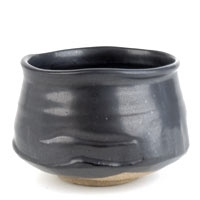 We offer several different kinds of handmade, 12 oz Matcha bowls from Tokoname, Japan. 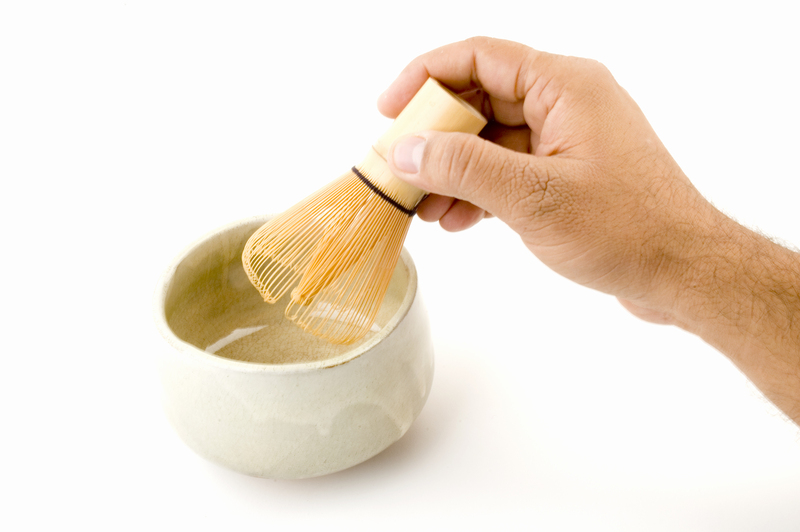 The curved portion of the tea scoop, or Chashaku, is used to scoop tea from the Natsume. The Chashaku that we sell is made from black bamboo; often, more elaborate and decorative Chashakus will be used in ceremonies. 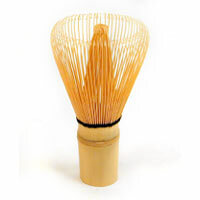 The bamboo whisk, or Chasen, is used to dissolve Matcha in water. Many types of Chasen can be found in various colors and thickness. 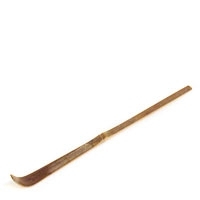 The highest quality whisks are made by hand, including the detailed work of curling thin strands of bamboo. The tea caddy, or Natsume, stores the tea. Use 3 scoops of Matcha for 8 ounces of filtered water at 160 F. Press on the tea powder gently, use the whisk with a fast, sideways motion, and bring to a froth. 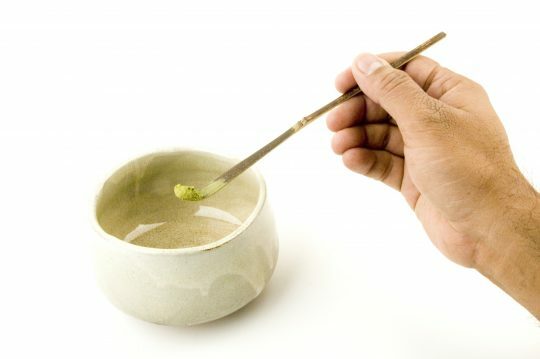 Usucha, or thin tea, is prepared with half a teaspoon of Matcha and approximately 75 ml (2.5 oz) of hot water, which can be whisked to produce froth or not, according to the drinker’s preference (or to the traditions of the particular school of tea). 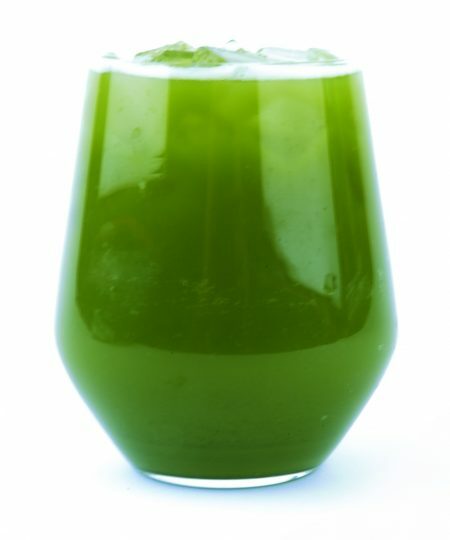 Usucha creates a lighter and slightly more bitter tea. 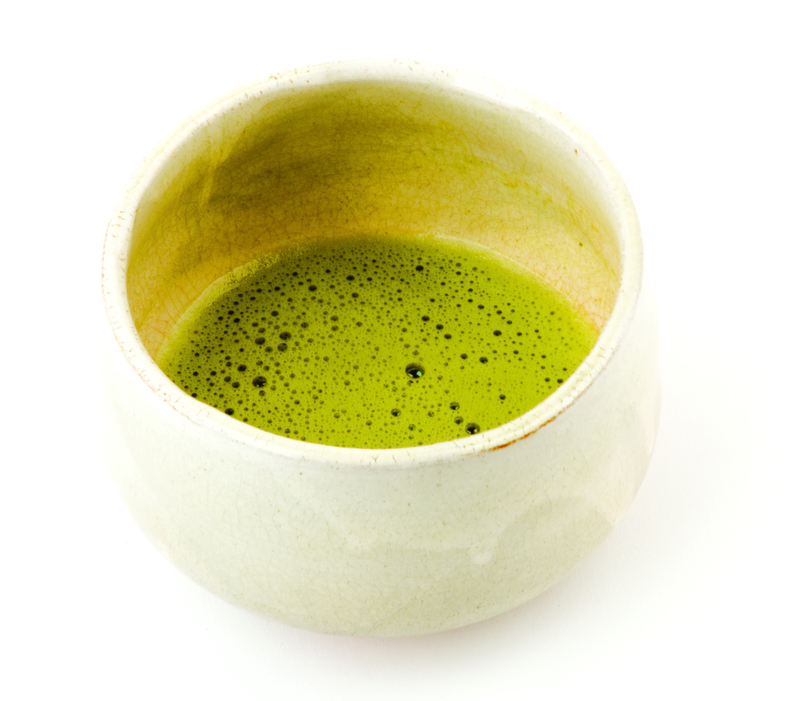 Koicha, or thick tea, requires significantly more Matcha, as many as six teaspoons, and up to 3/4 cup of water. Because the resulting mixture is significantly thicker, blending it requires a slower stirring motion which does not produce foam. Koicha produces a sweeter tea, and is served almost exclusively as part of Japanese tea ceremonies. Sweet, creamy, and buttery with a rich oceanic taste.